MUNICH, Germany – bauma 2019 has come and gone attracting a record breaking 620,000 visitors from around the globe. They wore out their shoe leather going from one to another of the 3,700 exhibitors from 63 countries, the largest numbers ever. 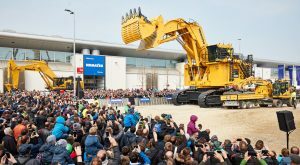 This was the biggest in bauma’s 65-year history. Once again bauma proved to be a success with not only visitors, but also exhibitors, who reported writing many orders. As one said, most visitors were specifically interested in buying, fuelling hope for continuing economic stability. The next bauma trade fair will be April 4-10, 2022. In the meantime, click here to read about the three industry trends that dominated the fair.